knew I should have got too excited, thought the engine was ok now that the oil pump fixed so was going to take the wheels off to send to triple s for powder coating and looking forward to getting tyres and going for the MOT, but when I took off the right exhaust so I could jack and block up the bike I found it full of dirty oil again??? when I first got the bike it had stood for ages, I took off the exhausts and only after 2 days I noticed a pool of oil only around one of the two exhausts I had both exhaust stood upright in the shed and only after 2 or 3 days did the oil leak out, it was about a quarter cup of very dirty black oil. I thought maybe this had just accumulated over time so wasn't too worried. before I tried to start the bike first time, I drained the gear oil and found it to be brand new see through red oil, I renewed it anyway then changed the coolant etc. Bike started fine after a few kicks and once I sorted the gears I took it up and down the road 5 mins max and found it pulled fine really smooth, then I have had it ticking over on 40 to 1 premix for no longer than 20 mins while I sorted the oil pump, so thought all was good. so today I took the exhaust back off and when I tipped the right one up at least a quarter of a cup of real dirty black oil and creamy grey sludge came out?? So I am at a bit of a loss now? 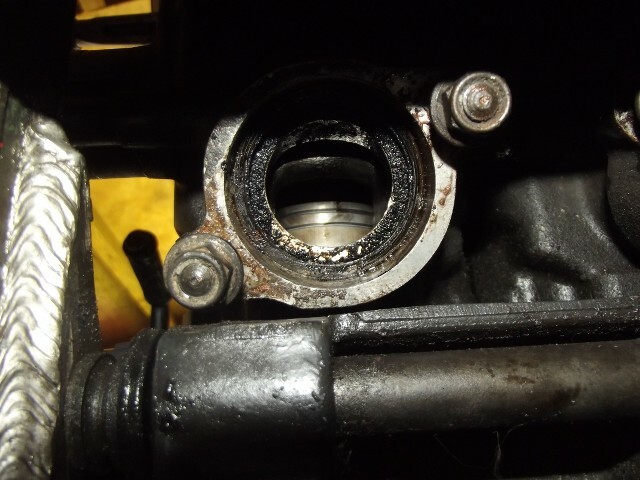 I was thinking crank shaft seals but cant see how that much oil accumulated over only 20 30 mins of the bike running when I didn't see a drop when I ran it for 10 mins? also the oil was very dirty and grey sludgy looking. I had 800ml of oil in the gearbox approx. and when I drained it again I still had just a tad under 800ml but the oil in the exhaust was at least 100ml maybe even 200ml?? I was hoping it was just solidified old oil that's warmed up after I got it started but just seems too much? Your neighbours are a lot more tolerant than mine. How often do any of us take the exhausts off our bikes and hold them up to see if oil drips out ? Can't really say if that's normal or not. Maybe running it for longer got it hot enough to free a bit more internal crap ? 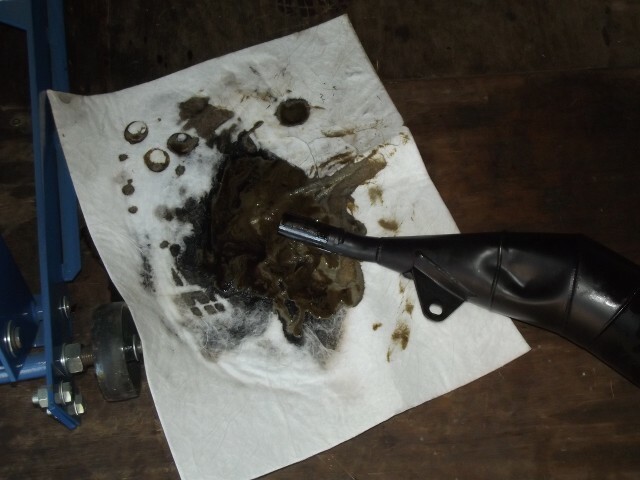 I do know that it can take a huge amount of effort to properly clean years of built-up crap from a 2-stroke exhaust. I had to cut one in half with a grinder and gut it once, it was so bad that the bike would barely run. If it was me, I'd be interested in whether the engine was drinking 2T at the correct rate and running properly. I wouldn't particularly care about what was coming out of the pipes, as long as everything else was OK. Might just need some regular use where it gets properly warmed up ? The oil just ran out as soon as I took the exhaust off to stand it in the corner while I tried to jack it up by the frame to get wheels off. I thought if it could spit that amount out in 30 mins of running time since I got it started then I'd definately see some oil spitting out as it was running? I'm kinda hoping that it was a mass build up that had solidified a bit in the baffles and with the bike running for 30 mis or so and being in the warm weather it's warmed and pooled in the exhaust. Just was a lot to come out? The bike runs well and pulls good in 1st to 3rd as I've only run it up and down the road also doesn't smoke excessively?. All I've read point to crank seals throwing gear oil up but the oil was so black and crappy that it looks like it's years old? ok, so after speaking to Garry who kindly answered my email, I decided to check the baffles, I looked inside and they do seem to be coked up and full of gloopy creamy oil which is similar to what I found in the spannies, the end cans also seem real heavy but due to a lip inside I cant seem to let the gloopy oil out. Im hoping the accumulated oil in the baffles has run back in the spannies when I started the bike up and ran up and down the road. Garry suggested caustic soda so I am going try clean them out but worried about getting it on the aluminium shield. I am going to tape them up and cork up the outlet and let it sit for 24hrs with the caustic soda in it.